Killing Time - Saturn / PS1...what gives? Plus...anyone have a copy of this? Re: Killing Time - Saturn / PS1...what gives? I have never heard of a completed & unreleased version of Killing Time for either of these platforms. I heard that some work was done for the Saturn but that was just amongst chatter along the lines of "I heard they were working on KT for SS. That would have been cool if they finished it"
In all honesty it probably would have been like all ports of 3DO games to another console... crap. awbacon wrote: Plus...anyone have a copy of this? Yup this has been dumped and I do have a copy of it. As far as I can tell there isn't much difference between this and the released version(s) other than the code at opening video, the name when you go to start and some small rendering issues. The beta is v2.7 and the mail-in is v3.10, sorry I don't recall the version number of the retail copy. So my question...any way to play the beta w/ a retail 3DO? I've just been trying to obtain everything KT I can find...sort of a mini collection. So far just the complete long box US version, and the JPN import "Tozasareta Yakata"
It's unencrypted of course however I did try to do a force encryption. 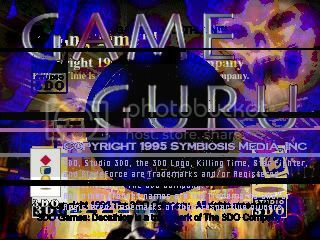 It booted a garbled splash screen of both KT and the Guru (if I hadn't made the iso myself I would swear the image was faked in photoshop) and then crashed. Couldn't find the image but still have the iso, so I made a new shot. Until we break the encryption or someone shares data that he says he has we won't be able to play it on a regular console. Regarding the abandoned ports, considering the framerate in the original 3DO game was pretty bad, I would be really curious to see how at least a PSX could handle the game (i.e., better in terms of framerate, I would assume).. It's really too bad it never came to fruition. Using the 3DO emulator for PC, the frame rate definately improves (even on my gf's Intel Centrino processor, since I use a mac) but it doesn't really improve the gameplay at all. The import version seems to have a slightly higher frame rate as well. As far as I can tell the JPN version is identical to the black mail-in disc (no map / polygon errors show up...at least I can't make them, so I am operating on assumption) but may be a tad faster framerate. Seems to be improved outside the mansion, when you are searching for the Invite form the hunters.